The April Center Blog: Anxiety, OCD, Phobia and Panic Attack Management - Los Angeles and San Diego: Is Blood Phobia or Anxiety Around Blood Common? Is Blood Phobia or Anxiety Around Blood Common? Blood phobia, although common, is a little different from other phobias. The difference is in one's biology. Although there seems to be no easy medical explanation, there are a percentage of people who are genetically prone to faint at the sight of blood. This is based on an apparent biological tendency for their blood pressure to drop when faced with blood. This is a serious condition for those who suffer with this anxiety and specialized anxiety treatment is required. 4.) Panic attacks can occur when faced with blood (panic attacks often accompany all phobias when a person is faced with their feared object, event or situation). 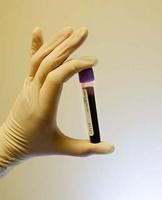 I treat many at my center who struggle with blood phobia. Although it may have severely effected one's life prior to getting help, it is highly treatable and can be overcome. Blood is not in and of itself dangerous. It is the nature of an injury or medical problem that can truly be of concern. So, if you have a blood phobia seek treatment. Don't let it get in your way!